Today is Thursday, September 30, 2004. The Loch Lomond Games are in two days. I've been getting in a good amount of pipes practice in before work lately. No big pipes today though. I'm nursing a mild sore throat, sipping tea as I type this. 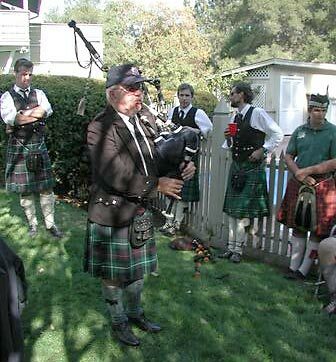 Hopefully, it will go away in the next day or so, as Saturday is going to be a grueling piping marathon since Santa Cruz Pipes and Drums will be performing on and off all day. Due to illnesses, etc., Jay Salter and I never managed to get together for a lesson since Pleasanton. I've tried to practice staying focused on the tune I'm playing. It's amazing how often I find myself thinking of something completely different than my playing at that moment. (My brain likes to do preemptive multitasking, that is, it goes where it thinks it's needed! Or away from where it thinks it's not needed!) I'm also trying to not think about expressing a particular note but intentionally focusing on where I am in the tune as a whole, especially with the piobaireachd. Up and out the door by 7:25 a.m. My throat is still nagging me, but it's somewhat better—most of the time I don't think about it. Do I really need all this stuff at the games? Probably not, but better prepared than not! Members of the band who were competing solo were to meet at the shuttle parking lot for a carpool up, but since no one was there, I took the shuttle bus up with my load o' stuff. A fellow named Wes introduced himself on the bus. He was competing for the first time and recognized me from this site—I'd replied to his contact message at one point. We hung out for a few minutes at the grounds, waiting for Ken Miller (bandmate) to set up registration somewhere, and ran into Kip Morais, his mom, teacher (Frank Conley) and friend. It was cold enough to see your breath, but that was to change. It got nicer as the day went on: sunshine, warm weather. The competition was to start around 10 a.m. I was the first to enter, so I was the last to play. 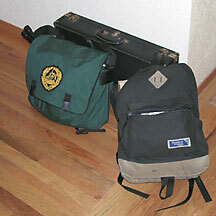 I stowed my things at the Santa Cruz Pipes & Drums band tent (after helping set it up). I was warming up and noticed Kip Nead had decided to come. (After Pleasanton, he wasn't sure if he was going to be able to make it to Loch Lomond.) We waved at each other across the fenced-off skateboard park area. "I thought that was you!" "I thought that was you!" The first event was the 2/4 March. 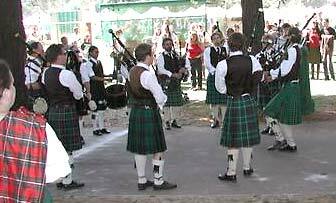 There were a number of competing pipers I recognized, like Tom Jenkins and John Hibble, among others. Jay tuned up all his students, Paul Llewellyn, Zach Duncan, Kip Nead, and myself. When Kip Morais had finished and the judge was done writing up his sheet, I walked up to Jim McColl, told him my tune. It felt like I played a it little faster overall than I had in the playoff in Pleasanton. I'm still not holding the initial low-A long enough before the following C grip, and this happens in every part repeatedly. It went reasonably well, though I hit a strange note in the last part for some reason, don't know how it crept in there, but it knocked me out of medals. As it was, I took 4th place. Kip Morais took first. C grips overdone a little—too much low G in them. After the 2/4 competition around 11 a.m., the band met in the parking lot to tune up in preparation of leading off the "Parade of the Clans" at noon. Fun stuff. Santa Cruz Pipes & Drums in the circle. I'm in the middle on the near side. To my left is Michael Haughey and to my right is Zach Duncan. 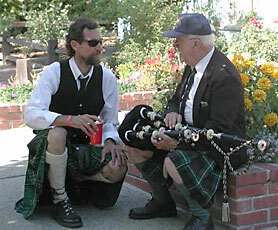 To Zach's right is Jay Salter, the Pipe Major (raised foot). Once the band duties were complete for that part of the day, the competitions resumed with the slow march around 12:45. Zach played pretty well, his embellishments sounded quite nice. Paul also played pretty well of what I heard. Again, Jay was able to tune me up. Tuning up was a little strange as I was going in and out of the sun, but tuning was good and held. I played right after Kip Morais and the performance went pretty well. My pipes sounded good, expression felt good, but a couple doublings become singlings—stiff fingers. But I stayed on the tune and the subtle errors didn't affect tempo or concentration. I didn't think I'd played that fantastic, but walking off, people were telling me how good it sounded. Kip Morais kidded, "That sounded pretty good. Now I'm worried." I was starting to wonder if the judge wouldn't notice the boo-boos. But Jim did catch the singlings, he always seems to catch those errrors! (And I'm glad he did, I'd hate to have a medal that might really belong to someone else.) But the rest of the tune was strong enough to garner myself a 2nd place and a silver medal! Zach Duncan took 3rd and Kip Morais didn't place, he was disappointed as you'd expect but happy with his two other medals of the day. My first ever silver medal! The band was to meet at 2 p.m. to warm up for another performance so the scramble was on to try and squeeze in the last event, the Piobaireachd competition. A fellow named Sean Campbell, whom I'd met last year, went first. I was originally going to play last, but in order to accomodate the band, Kip Morais and I were switched. I tuned up my own pipes, but I was having a hard time getting them to sound dead on. I'm going to blame the shade/sun factor here. I was hoping they'd lock in when I started the tune, but no avail. Once started, it was "focus, focus, focus." I played the tune, remembering where I was, not letting myself think of anything other than that. The couple of times I started to think of something else, I forced myself back into "where am I in this tune?" It worked. I didn't miss any notes, no bad embellishements, expression felt good and I didn't lose my place! I was very delighted! Jim told me "Quite nice tune." I strode off to the watching pipers and spectators with a broad grin and gave a couple of high fives. I was going to place on this one, no doubt—maybe gold, but I didn't want to get my hopes up since ya never know. Nancy Fredrick (in the band and has competed in Grade III with the same tune) said that my drones sounded very steady and that the last part which she heard sounded beautiful. I went off to band activites and returned later to find myself the proud owner of a new gold medal which was waiting at the WUSPBA table with my score sheets. The day was so packed, I forgot to dig out my camera to take photos for this page. Oops. Fotunately, Paul Llewellyn's friend Lynn took a few pictures. Jay Salter chats with Jim McColl, his long-time—but now infrequent—instructor. Jim McColl performs a few sets after his judging duties are complete. Behind him from the left are Michael Haughey, George Holbert, Jay Salter and Kip Morais. The knee at the lower right probably belongs to Frank Conley, Kip's instructor. The group talked Jim into playing a piobaireachd as an encore. We wrapped up band stuff with the closing ceremonies around 6 p.m., playing with the Irish Heritage Pipe Band and the Wicked Tinkers. Pretty exhausted, I caught a ride with Ken Miller to the shuttle parking lot and then home I went. When I told my wife I had won two medals, she said, "Small games?" Sheesh. No respect. OK, the big question. In a few months, I have to pick a grade for next year. I've started medalling pretty consistently. Not everything—that's for sure—but I won at least one medal at each of the games I've attended this year. I don't want to just hang out in Grade IV and collect medals, that's not the real point of competing, and it wouldn't be fair to the pipers new to competition piping. But if I were to get trashed in Grade III, then I'm not ready and I need to stay in Grade IV. Also, if I move up to Grade III, I'll probably not get to compete at Loch Lomond as they only held Grade IV events this year. I'd also have to play an entire piobaireachd, not just the ground and first variation. I might have to get a different mouthpiece to help me keep a better seal. Things to muse. Maybe one more year in Grade IV. I'll have to seek some advice. In EUSPBA, it's pretty easy, you apply and they tell you if you can move up—or, sometimes if you have to move up if you've simply been winning too much (which can happen in WUSPBA as well). Well, done for this year. I got my piobaireachd gold medal—finally—so I'm content with the season. Ended on a high note. Maybe I'll manage to attend a couple extra games next year. Today is Wednesday, October 6, 2004. Some people say I should move up to Grade III, but after talking to my instructor, Jay's thinking I should stay in Grade IV and continue work on my 2/4 March and quick tunes. My wife thinks I should stay in Grade IV until I place in every event I enter—I don't know about that, but she may be closer to the truth. * We'll see how the next six months play out . . . no pun intended! *In May of 2005, I received a message from a former WUSPBA Grade IV Aggregate winner, who told me that he only placed in about two-thirds of his events his winning year, so a piper shouldn't expect to place in every event prior to moving up. On the other hand he said there's nothing wrong with not moving up if you are not sure you are ready to do so.